When creating your user account, the administrator (or possibly the person who created your Dentrix Ascend account) initially sets up the information. However, you can update the information for your own user account at any time. On the My Account page, click (or tap) the Account Information tab. Update your email address, name, and/or phone numbers as needed. Email - Your email address. This email address will be used for sending administrative notifications to you (for example, if your user name is changed). First Name - Your first name. Last Name - Your last name. Phone 1 - Your primary phone number. Phone 2 - Your secondary phone number. Organization Login - This is the name of your organization and is used for logging in. 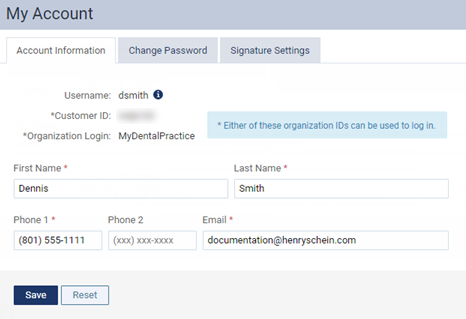 Alternatively, to log in, you can use your Customer ID, which was assigned to your organization when your Dentrix Ascend customer account was created. You can change your organization login from your website profile setup. Username - Your user name is used for logging in. You cannot change your user name from this page; however, you, if you are an administrator, or an administrator can change it on the User Accounts page. An administrator can change any of your account information. When you or an administrator make a change, a notification is sent automatically to the email address entered for your user account. If the email address has changed, a notification is sent to the new email address.